NEXTEC 4.0 is the local solution for your transparent production control. With the NEXTEC 4.0 Network PC you can digitally connect furniture planning in the office with the machine. All CAD/CAM data created in the office with the planning software is transferred via the Warehouse Production List to the CNC machine in the workshop. Digitization is simply thought of and tailored to carpenters who want their data to remain locally in their own workshop. 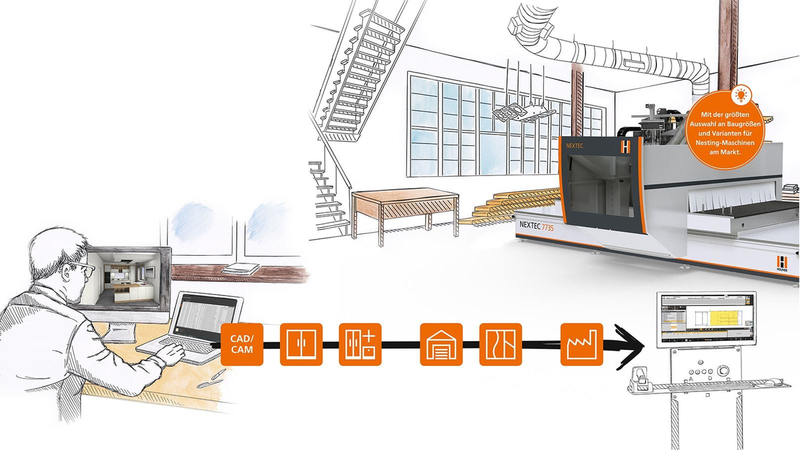 With the largest selection of sizes and variants for nesting machines on the market, HOLZ-HER offers you not only the networking between office and workshop, but also the matching CNC machine. See for yourself.